It isn’t often you get to meet someone who’s helped grow the sport of hunting into the mega giant it is today, but I recently had that rare opportunity. 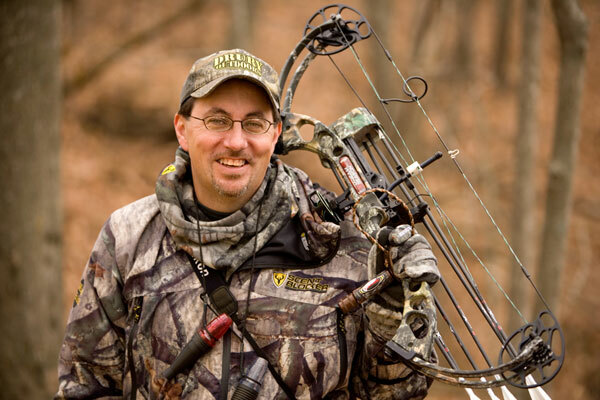 Mark Drury, the co-host of Bow Madness, Dream Season and Wildlife Obsession came to Upstate New York for an evening of food, drink and as you may have guessed, hunting. Drury needs no introduction, but for y’all who don’t know (mainly my city relatives), he and his brother Terry began producing hunting videos since 1989. The duo is the real deal, the big time, the whatever you want to call ‘em … they’re it. I’ve had the privilege of meeting several hunting celebs over the years, and all have turned out to be what I hoped – just regular guys sharing a common passion. Drury is no exception. An Iowa boy who made it big, Mark Drury remains humble and driven by his passion for hunting. Drury addressed our group and then graciously answered questions for over an hour. From this, four themes seemed to emerge. First – Technology only takes you so far. Drury, who is endorsed by Scent Blocker, openly admitted that there is no substitute for a favorable wind. Will scent elimination products improve your chances of harvesting that animal of your dreams? Yes, according to Drury, but other factors come into play – mainly he says wind direction and the speed of the wind.. Hunting is hunting, and fooling a wise old whitetail isn’t easy. We all know that. Second – If you feel the urge, kill ‘em. Drury says a trophy to you may not be a trophy to him. His theory – if you get the feeling over a certain animal, whack ‘em. Having said that, Drury said he believes whitetail deer don’t reach their full potential until the ages of 7 – 9. Here in New York where I hunt, it is extremely rare to encounter a deer that old, so to me a 3 – 4-year old deer is a trophy and, in that case, I will almost always feel the urge. Third – Hunt the edges. Drury preaches and practices non-intrusive hunting tactics. He says his success comes from hunting the perimeter. He suggests that you do the same and not penetrate your hunting parcel, rather set up on the edge, hoping to catch that mature deer on his feet … makes sense to me. Fourth – Use trail cameras to find and locate you deer – and don’t check them too often. Drury says he sets his cameras out in the summer and often times won’t check them until October. He says on many occasions, he’ll capture over 300,000 images from one camera set. He has around 50 cameras running on his farms today, and although that may not be feasible for most of us, we all can afford a camera or two to help gain that advantage. Point made. One other interesting note that Drury shared with me is the ramped poaching he deals with on a daily basis. He said some scum already this year poached a 165 + deer on his land. He says every year he finds numerous headless animals on and around his property. Sick isn’t it? The best deterrent he’s been able to come up with is planting vegetation along the edges and along the roadways of his property to physically block the poachers’ view. I’ve had the displeasure of having an animal I was hunting poached, so I feel for Drury on this. So there you go, tips from a true hunting star! Happy hunting this fall!